Balinese or simply Bali is a Malayo-Polynesian language spoken by 3.3 million people (as of 2000) on the Indonesian island of Bali, as well as northern Nusa Penida, western Lombok and eastern Java. 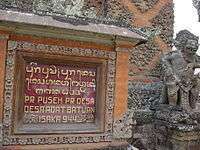 Most Balinese speakers also know Indonesian. 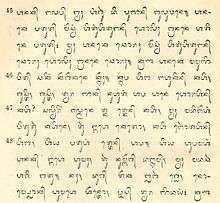 Balinese itself is not mutually intelligible with Indonesian, but may be understood by Javanese speakers after some exposure. ↑ Hammarström, Harald; Forkel, Robert; Haspelmath, Martin; Bank, Sebastian, eds. (2016). "Balinese". Glottolog 2.7. Jena: Max Planck Institute for the Science of Human History. ↑ "Balinese language 'will never die'". March 30, 2012. 1 2 3 Spitzing, Günter (2002). Practical Balinese: Phrasebook and Dictionary. Rutland VT: Tuttle Publishing. p. 22.